battenfeld-cincinnati introduced a wide range of new machines at K 2016, among them the “Next Generation” of its single screw extruders and conical twin screw extruders, the FDC (fast dimension change) system for PO pipe extrusion and the new BCtouch UX control. These highlights will also be shown at Interplastica 2017 at battenfeld-cincinnati’s booth in hall 2.2 / B20, alongside proven equipment for pipe, profile and WPC extrusion. 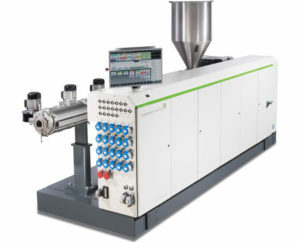 The solEX NG single screw extruder series is available in four sizes (60, 75, 90 and 120 mm) and offers outputs ranging from 1,000 to 2,500 kg/h – an increase of up to 25% for individual machine size compared to the established solEX series. The solEX NG series is equipped with a new, groundbreaking processing unit – barrels, screws, and grooved bushing have all been completely redesigned. The advantages are up to 10°C lower melt temperatures for comparable outputs, optimized, constant pressure build-up and reduced maintenance costs. Thanks to the lower drive energy and reduced energy losses, energy costs can be decreased by up to 15%. With their high outputs and excellent melt processing capacities, solEX NG extruders are ideally suited for large diameter PO pipe extrusion lines. This was also the reason that Jain Irrigation Systems Ltd, India, chose a solEX NG for the 2.5 m HDPE extrusion line they bought from battenfeld-cincinnati at the K show in October 2016. The Fast Dimension Change (FDC) system has been designed for automatic pipe dimension change within a specified range during production. This enables pipe producers to gain enormous production flexibility, as well as to reduce energy costs and save material thanks to much shorter changeover times. The extruder control has been extended to enable the changeover of all components in the line at the push of a button. The FDC system is available as a complete line for pipe diameters up to 630 mm. Individual components to retrofit existing lines are available for pipe diameters of up to 1,200 mm. 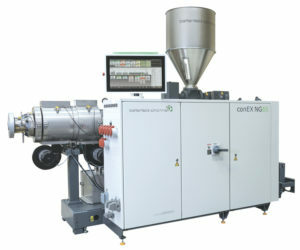 The conEX NG conical twin screw extruder series is available in three sizes (42, 54 and 65 mm). With outputs from 20 to 250 kg/h for PVC profile and WPC/NFC and from 60 to 450 kg/h for PVC pipe it offers maximum productivity for global demand. The conEX NG features a longer pre-heating zone and an optimized screw design for higher outputs. With the new geometry concept, wear is minimized and a great variety of material blends can be processed with the same screw. The machine can be operated under a permanent process pressure of up to 520 bar. Thanks to its low energy consumption and reduced footprint, the conEX NG is also an excellent choice for co-extrusion. It is available with several different space-saver or pedestal designs and can be optimally adapted to every basic extruder, thanks to improved height and tilt adjustment facilities. Apart from conEX NG co-extruders, battenfeld-cincinnati also offers its range of fiberEX extruders particularly for WPC/NFC extrusion along with complete, customized lines. The core features of the more than 260 WPC/NFC battenfeld-cincinnati lines installed worldwide are functionality, easy handling, process stability and cost efficiency. battenfeld-cincinnati’s new BCtouch UX control system features an operating concept modeled on modern communication media with an intuitive menu navigation. With its advanced functions, it supports efficient production planning and preventive maintenance intervals, and fulfills future requirements for connectivity with servers and mobile appliances. In this way, it also provides the prerequisites for comprehensive process data acquisition and evaluation, and for vertical integration according to the Industry 4.0 concept.